RUSH: The president just had a little gaggle with the media in the Oval Office, and the upshot of it is that he says he's got tremendous Republican support on this. This is in reaction -- there's an AP story out there saying that the Republicans are cracking. What's the headline? “Republicans Cracking.” That's the Drudge headline. “Republicans Cracking.” That means Republicans going wobbly. Republicans getting nervous. Nothing new about that. They always cave during Republican shutdowns. They're used to having caved before this! So they're out there getting nervous and so forth, and Trump I guess was asked about it, and he said he's got tremendous GOP support. Listed some names, and he said that he would be the first to know if he didn't have the support of congressional Republicans and spent some time going after people in the media as well. Jonathan Karl, ABC News, said that Trump wants a deal, says he'll go the route of calling a national disaster on the border if he has to. So all indications are that the president remains committed to this. And I think the story is -- like Maggie Haberman, the New York Times, saying that Trump let it be known at the luncheon yesterday he didn't even really want to do this speech last night, you know? He didn't even really want to do it, yo! He's just being forced into doing this by his communications staff, but his heart's really not in it. Dream on, you people. I don't think the media has earned our right or our expectation to believe them. I don't think they're even close. I think the default reaction to anything they report about Trump ought to be we just don't believe this and we're gonna wait for independent confirmation of it because we know you people are out trying to ruin this man and his presidency. And so anything you say about him we're gonna be suspicious of. And Trump took it on directly today, again pointing out that he has tremendous GOP support and that he'd be the first to know if he didn't. But you know what, let's say, just for hypothetical purposes here for the fun of it, let's say that Trump begins to lose some Republican support. You think he could still go this alone? By definition, he can go it alone. 'Cause I, for one, happen to believe -- you know, you've heard stories that Trump is isolated and alone in the White House. And these stories, they basically were out there over Christmas, Trump was supposed to come down here, supposed to come down to Mar-a-Lago, which is his resort. And he was gonna spend two complete weeks. And before the trip, what was the media saying? The media was saying that Trump's exhausted, that he's depressed, that he hates the White House, and he despises Washington, and he's got to get back home and he's got to get back to familiar surroundings, that he's got to get back to where there are at least some people who don't mind him being around. And then the shutdown came. And Trump announced that he was staying in Washington for the duration, that he was not gonna be going to Mar-a-Lago. And so then what did the media did? Well, the media started with these stories, Trump is isolated and alone, spending Christmas with no friends and nobody there in the White House. And they tried to create this impression that this is a very dangerous time. We have this isolated, lonely, despondent, depressed president stuck in the White House, nowhere to go, nobody wants him, nobody wants to hang around with him. This is what we got as news. Now, I think, when you start talking about political isolation, let's say a bunch of Republican members of Congress do go wobbly. We wouldn't be surprised, would we? This is exactly why Donald Trump was elected. I don't think the Trump supporters, the Trump base or whatever, the idea that all of Washington would from time to time be aligned and arrayed against him is anything other than what was expected. It's why he was elected! He is a known insider, and we were talking about it yesterday. I still don't think anybody in that town knows how to translate Donald Trump. In fact, let me tell you a little story without names. I had occasion within the past 12 months to play golf with some people in the Trump regime. Three of them, one of me. These are all limited government people. These are all very loyal and reliable conservatives, not a Never Trumper among 'em, don't misunderstand, but they all work in government. And I'm telling you for 18 holes they were talking a different language. And it was clear to me that they relished it. I mean, they’re in government and they've got their jobs there and they very much appreciate them. But there was no indication of there being any distrust of government or any of the things that you and I associate with it. Now, my point is, Trump's not one of those people. Trump is not a government guy. He's a private sector person whose life has been lived, whose successes have been realized as far outside that realm as you can get. The closest Trump came to it was occasionally toying with the idea of running and donating to various candidates. But in terms of living his life and running his business, his relationship to politics was dealing with whatever regulations stood in his way. But government was not his day. Government was not his way of life. Even Trump supporters in the government, even the people that love Trump, government is their way of life. Now, you add to this into the mix people who hate Trump and are in government and love it, and that's mostly the media, 'cause the media is as much a part of government as the Democrat Party is, in their own minds, at least. The disconnect and divide here is such that they still cannot, even if they wanted to, I don't believe, understand Donald Trump. I don't think they have the ability to step outside their world and look at how people outside their world live. They judge everybody on the basis of how they live and what they do, what they say in the context of their world. And then they judge it, yay or nay, up or down, positive or negative based on that. It's the height of provincialism and it's egoistic at the same time. 'Cause there is no other world than theirs. And if somebody in it doesn't adapt to them, then they are the problem. Well, Trump is not going to adapt to them. I think he tried, actually, the first three, maybe six months. I think he tried to adapt. I think he tried working with them on the Obamacare repeal and replace and a number of other things. Some of his staff choices came from suggestions of the GOP hierarchy, the Republican National Committee. He tried, I think he made every effort to try to adapt to that world. And it got him nothing. It got him nowhere. It ended up that he ended up with a bunch of saboteurs. I had a story yesterday that I didn't get to, but I saved it, and I have it right here. And I think this is right on the money. It's Steve Hilton, who is the Brit that came to fame during Brexit, now works at Fox News. The headline of his piece here: "Mattis, Kelly Marched to the Establishment Beat. Trump Was Right to Fire Them." It goes on to say that what has been going on for the past year or more is that elements of Trump's inner circle have literally been plotting to stop his agenda in order to protect the establishment -- and Hilton names names. Gary Cohn, who was one of the early economic advisers; James "Mad Dog" Mattis, secretary of defense; John Kelly, the chief of staff; and Rex Tillerson. "Mattis and Kelly may have been heroes in combat," but don't know much "about civilian government, and the way they behaved was not just disgraceful, but frightening. They tried to impose their military views, even after they'd been rejected by civilian leadership. They were self-righteous, subversive and disloyal. Oh, and swampy at the same time. After leaving the Army, Mattis was paid $242,000 and up to $500,000 in vested stock options by the company General Dynamics, which builds tanks submarines and munitions. "He also received a $20,000 speaking fee from defense giant Northrop Grumman. John Kelly was paid $166,000 as an adviser to DynCorp, a company that gets 96% of its revenue from government contracts. These ex-generals, along with the other former and current establishment stooges in the Trump administration, just love telling their in the press -- off the record, of course -- about their noble role saving America from disaster by controlling a crazy president." Well, how did they get hired in the first place? As you know, and as I have reminded you on several occasions, I have been flummoxed and perplexed by many of Trump's staffing choices. But as time has gone on, I think I understand why they were made. He was attempting to placate. He was attempting to build a bridge to these people. He was attempting to adapt. He was attempting to unify. And it was a lost cause because the people to whom he was reaching out were wolves in sheep's clothing and had as their objective to sabotage as much of his agenda as possible. And, of course, if you remember when "Mad Dog" Mattis was hired, the announcement was here at Mar-a-Lago in the giant ballroom there. I will never forget the Drive-Bys being orgasmic. It was a great relief. "Finally! Oh, good! We got somebody who understands how things work here. Good. Somebody's gonna limit Trump. Somebody's gonna tell..." They tried to disguise it by praising Trump for having the good sense to hire somebody that knows what Trump doesn't know, and ditto with Tillerson. Tillerson surprised me. I thought Tillerson was a good hire. I got totally sandbagged by that one. But I can say that Mattis and Kelly, I had red flags from the moment they were introduced, simply 'cause these are... In the Pentagon, folks, as we've discussed, you got your warrior generals and you've got your political generals. You've got the generals that get their stars with battlefield valor and victory, and we've got generals who get their stars by climbing the politically correct inside-the-Beltway ladder. Like this General Stanley McChrystal, who was a total toady for Hillary Clinton who did nothing but sell out the U.S. military. Benghazi is the most glaring example. You look at these people and ask, "How in the world could any legitimate military person support Hillary Clinton? How in the world?" But many of them did because that's who they are first. Liberals are always liberals first and whatever else they are second, including whatever their religion is, whatever their careers are. They are liberals first -- and maybe even second. So Trump has, I think, tried to adapt. I think he has attempted to cooperate, attempted to unify. And rather than be treated respectfully in this regard, people have accepted these entreaties and his job offers with the intent of sabotaging him, and Steve Hilton calls out these four in his piece at Fox News. But my overall point here is that despite all this, Trump is still there. Despite the saboteurs and their best efforts, guess who's gone? The saboteurs. Look at the FBI. Look at how many of the snakes in the FBI and the DOJ are out now, starting with the McCabes and then the Strzok Smirks and the Lisa Pages and all these people that ran this clandestine spy operation to destroy the Trump campaign and his presidency. For all of that, they're the ones who are gone. Comey? They're gone. Now, they're still out there trying to wreak havoc and damage, but they're gone. Trump outlasted them. Oh! That reminds me. 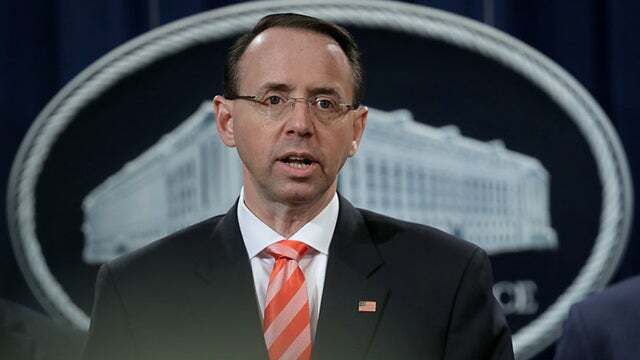 The news hit today that Rod Rosenstein, deputy attorney general, is going to leave. This isn't news! He was always gonna leave once the AG that's been nominated, William Barr, is confirmed, because Barr will then get to choose his own deputy if he wants, working with Trump to do it. So it isn't news that Rosenstein was gonna leave, but that doesn't mean the Drive-Bys cannot have a fit about it. And they're trying to lay the groundwork that Trump knows. "He knows that Mueller is gonna have a devastating report so he's getting rid of Rosenstein! Trump's firing this guy!" That's not at all what's happening. But Bret Baier said today earlier on Fox that the Rosenstein resignation is part of the process of the end of the Mueller investigation. Bret Baier thinks that the Mueller investigation is just weeks away from ending and being reported. And whenever that is, whenever that report's released, whenever Mueller wraps it up, it's gonna be... Brace yourselves. It's gonna be the biggest neutron explosion in that town since Watergate, before anybody even knows what's in the report! That ends a direct DOJ connection to Mueller.